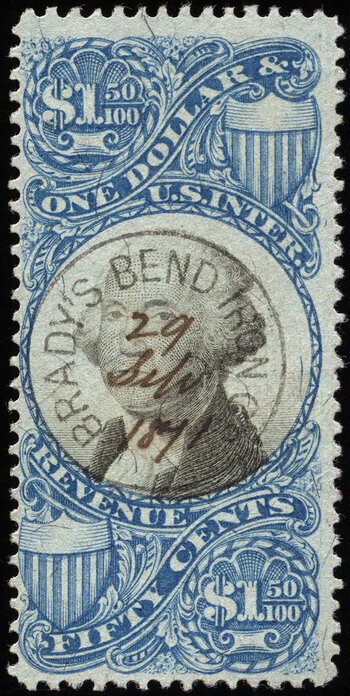 Printed revenue stamp cancels from the Brady's Bend Iron Co.
the Brady's Bend Iron Co. 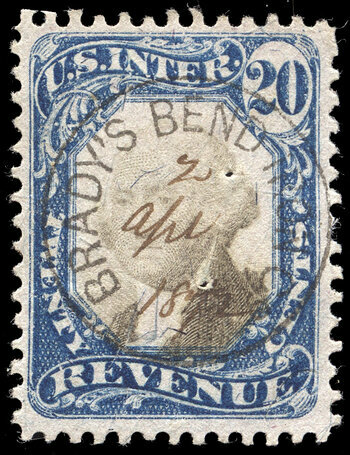 I remember the first time I saw the circular cancel for the Brady's Bend Iron Company. I was enamored with how perfectly struck and centered it was. 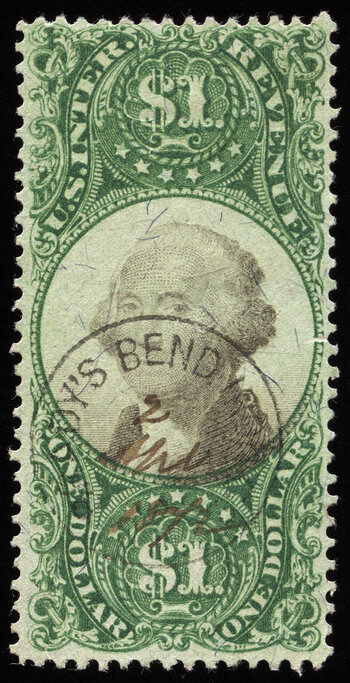 Since then, I've tried to find examples of the cancel on other stamps of the 1st–3rd issues. 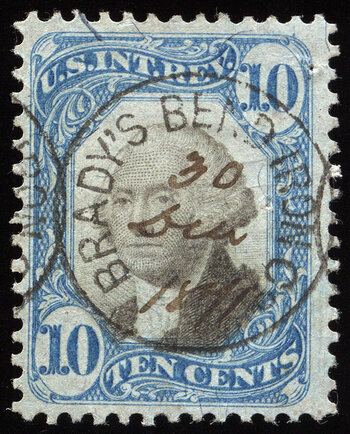 It was only when I saw and acquired Michael Morrissey's exhibit page (shown below) devoted to these cancels that I discovered that these in fact are not handstamp cancels, but rather printed cancels (the cancels are printed onto the stamps via printing press). Just seeing an isolated example doesn't make it apparent, but when you see a number of the different stamps side by side, it jumps out at you. 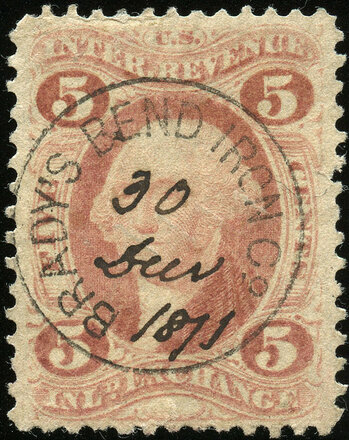 If these were handstamp cancels, they would be canceled at different angles of rotation, and would have much greater variance in strike and completeness. 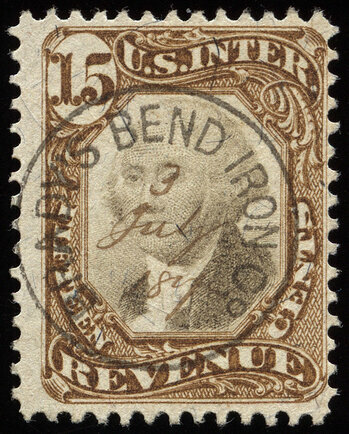 I am trying to acquire examples of this cancel on as many 1st–3rd issue revenue types as I can. The ones I own are all shown beneath the exhibit page below. 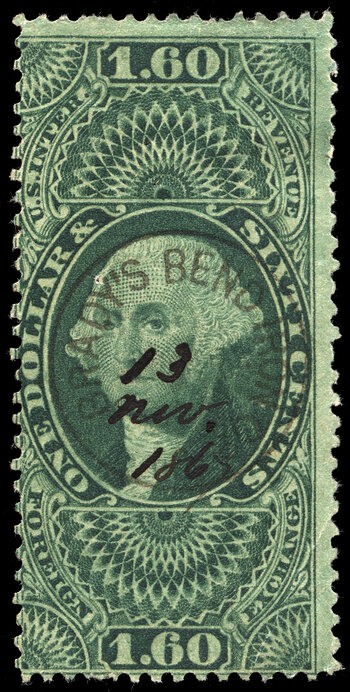 If you have examples of this cancel on stamps other than those types pictured here, please email me. 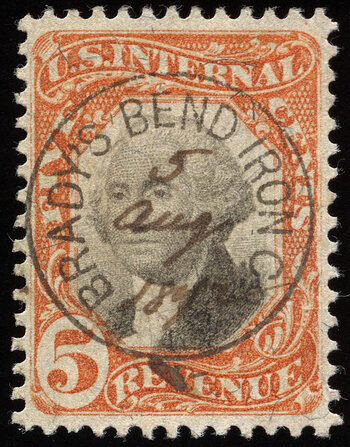 The Brady's Bend Iron Co., located in Armstrong County in Western Pennsylvania, specialized in the manufacture of railroad rails. Railroads of that era suffered from highly-speculative investment and rapid over-expansion. This led to the Panic of 1873 and the bankruptcy of this and many other businesses tied to the railroad industry. 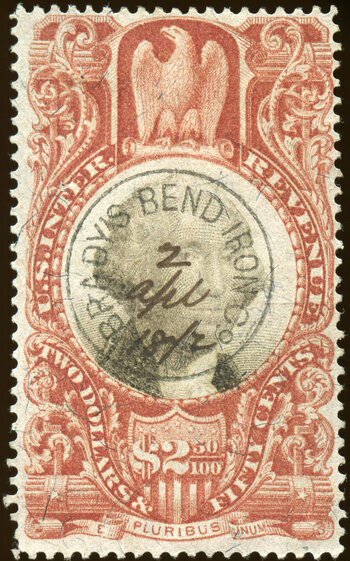 At first glance the company revenue cancels appear to be steel-die handstamps, but close examination reveals that they are actually printed. 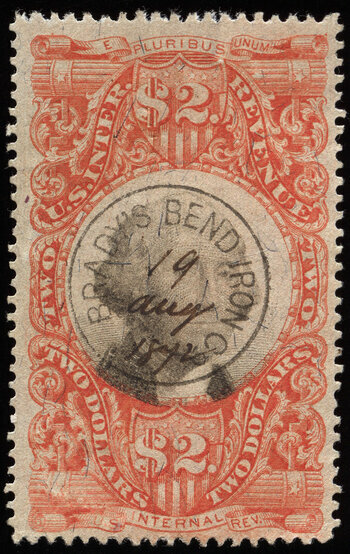 Judging from the values used, it would seem that the company issued a plethora of promissory notes in the 1871 and 1872 period, evincing a possible inability to pay on time and in cash, in a vain effort to stave off bankruptcy. Beyond those stamp types shown in the exhibit, I have also obtained the cancel on seven additional types, R27c (5-cent Inland Exchange), R53c (40-cent Inland Exchange), R79c ($1.60 Foreign Exchange), R96c ($10 Probate of Will), R111 (20-cent blue), R115 (50-cent blue), R140 (30-cent orange), and R146 ($2.50 claret). 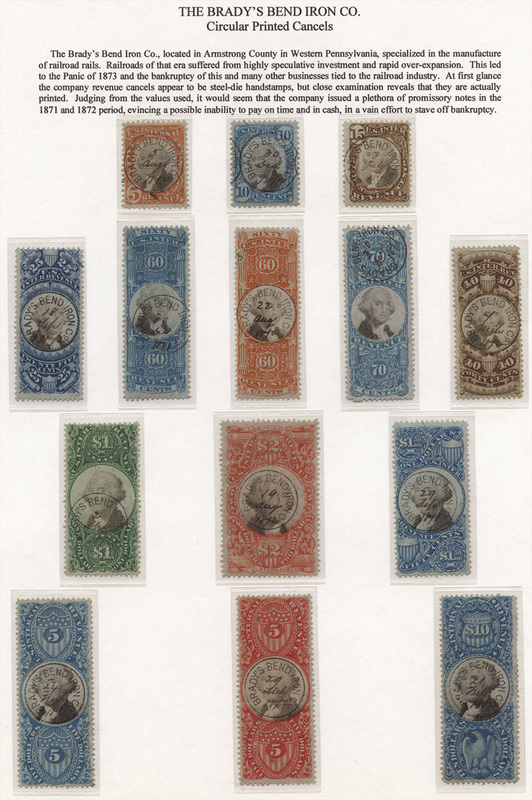 All of the stamps are shown below, sorted by issue and denomination. Click on any thumbnail to open a new window with more information and higher-resolution images.